This B&B in the heart of Puerto Viejo offers 3 suites or the tropical wood home. Located 2 blocks from the sea with a private courtyard, pool and Wi-fi. Suites offer AC, kitchenettes, organic amenities and continental breakfast. The tropical wood home sleeps 4, with one king and one queen bedroom, a kitchenette, private seating area, screened windows and ceiling fans, spacious bath with hot water. Sueño Grande has it all. Blissful comfort, sense of security important to single female travelers, and location, location, location!! You’re two blocks from the beach, and in the opposite direction, two blocks from groceries, restaurants, shopping and night life. Two small blocks! Jody’s breakfasts are legendary among other hoteliers in Puerto Viejo. The presentation is gorgeous and the combination of varying baked goods with local fruits can’t be beat. Whether you’re a go everywhere, do everything traveler, or like me, a do not much besides snorkel and sample restaurants vacationer, Jody can give you exactly the experience you’re looking for. Next time I’ll take more advantage of Jody’s experience and services for some sightseeing. There’s nothing nicer than being in a beautifully designed suite with air conditioning overlooking the gem of a pool, reading a good book and watching Kisskadees bathing or swooping by for a drink. Loved the house geckos and anoles running about, plus bees and butterflies dancing through the garden. And a resident crab! He’s quite shy, but if you leave a tidbit of fish or meat by his hole, it always disappears. It was my first time out of the US in far too many years and it was *exactly* what I needed. 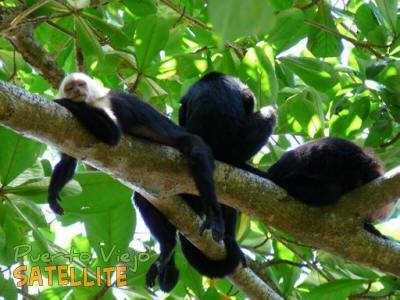 Relaxing in the lush beauty of Puerto Viejo while enjoying the pleasures of an excellent and lovely B&B. I stayed at the Sueno Grande in late December and I could not be more happy with my stay. It was very clean and nicely decorated. Jody was incredibly accommodating and the food served every day was excellent (she even sent me with a bag of food for the road on the day I was leaving which was a great surprise and treat). I was travelling alone so safety was very important to me and I felt very safe at the Sueno Grande. She also gave excellent recommendations on things to do in the area. It was close to the beach and within walking distance from town. I would stay again if I had the opportunity. Sueño Grande is a wonderful new B&B in the idyllic setting of Puerto Viejo. The pool is the perfect respite and the ocean is a short walk away. There are a number of nearby restaurants and plenty to do within an easy bike ride. Jody has plenty of ideas for things to do and is helpful from the moment you get to the airport in San Jose. The rooms are spacious and as nice as anything you would find in the US or Europe and better than nearly anything else you will find in Costa Rica. If you like comfort along with hanging out at the beach, or adventures, Sueño Grande is the place for you. For those of you wanting to experience living & traveling on the south carribean side of Costa Rica, staying at Sueno Grande B&B in Puerto Veijo will be the perfect place for you. From when I landed in San Jose, Sueno Grande B&B helped to arrange my shuttle service and delivered me right to the B&B's front door within 4.5 hours. Sueno Grande B&B is located in the perfect location in the town, where it is two blocks from the beach, but also tucked further back from the main night scene to provide some tranquility, quiet and peace. It is within walking distance to all the great restaurants (e.g Cafe Rico, Bread and Chocolate, Stashu, etc), bike rentals, your tour booking facilities, and artisan and clothing stores. The grocery store is just around the corner for when I want to make a meal in the suite. I recommend renting a bike to get around the town, as well as for day trips to adjacent beaches and towns. The bike will also provide additional safety for when getting around at night vs walking. Sueno Grande B&B has plenty room to store your bikes. The B&B is a private property and is surrounded by a 10ft wall that provides a layer of safety for your belongings. Jody, the owner lives on one side with her two Great Danes, that also provide additional safety to the property. Separating where she lives and where the guest suites are, is a beautiful pool with waterfall, and is great for tanning and relaxing. The room has wifi, air conditioning, a fully stocked kitchenette, stove, and fridge. The large room is beautifully decorated, super clean, with a very comfortable king size bed. The bathroom is beautiful with a walk in shower and hot water is available. Breakfast is tasty and the baking is just yummy. I stayed at Sueno Grande B&B for three weeks, and made it my touch down place for when I biked to surrounding beaches and towns (eg. Cahuita, Playa Negra, Playa Cocles, Punta Uva, Playa Chiquita, Manzanillo), traveling into the tropical jungle (eg. Bri Bri, Hone Creek), visiting the botanical gardens, the animal rescue centers, massage/spa, going to yoga classes at Cashew Hill - OM, and even making a short trip into Panama. For those of you who are willing to do the bike ride and not afraid to get some sun, Sueno Grande B&B is all within biking distance to these towns and beaches. You can also get easy access to taxi and buses from the B&B to these beaches/towns. Jody the owner, is very well travelled and is very knowledgeable of the town, the activities, and restaurants. She is knowledgeable of the plants and animals in areas. She can help you to refine your vacation to become memories to last a lifetime. When you are preparing yourself back to go home, Jody will also set up your transportation back to San Jose, to get you back safe and sound. I definitely will be going back for another visit!